Hugo Rivera is R B Holt’s project superintendent. 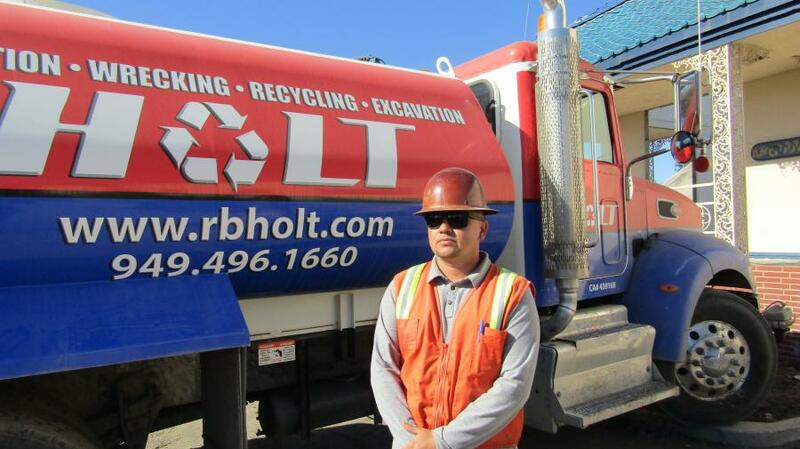 R B Holt, a demolition company based in San Juan Capistrano, Calif., has built a solid reputation for quality and customer service. Focusing primarily in South Orange County, the company performs demolition, asphalt removal, brick reclamation, concrete removal, floor removal and material reclamation. R B Holt specializes in custom beach home demolition and to date have taken down more than 3,000 homes. The contractor started its most recent demolition project at 420 W. 6th St. in Tustin, Calif.
Work has involved the demolition and removal of a multi-unit office space consisting of a school, warehouse, retail and office space in preparation for the development of a multi-unit housing complex. Some of the concrete structures were two stories, including an underground parking structure. Prep work included gutting the buildings inside down to bare concrete before actual demolition of the tilt up concrete walls began. With an expedited timeline and minimal clearance to neighboring structures, the project's success hinged on choosing the best performing machines to help raze the more than 350,000 sq. ft. of concrete tilt-up building. These machines would need to move more than 25,000 cu. yds. of debris and more than 1,500 tons of trash quickly and effectively. 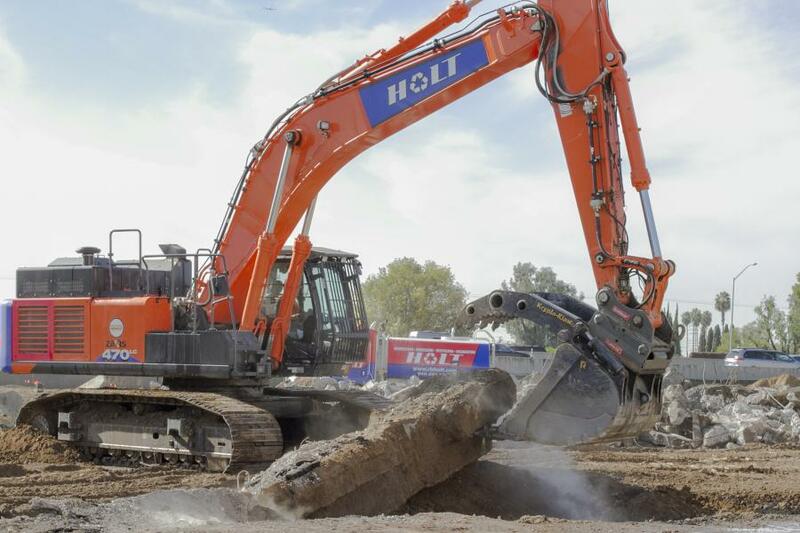 For the job, R B Holt used Hitachi 350LC and 470LC excavators. Equipped with a thumb bucket, hydraulic hammer and concrete pulverizer, the excavators enabled R B Holt to size and prep material for its portable concrete crusher for onsite crushing. The crushed concrete and asphalt will later be used to make road base material, which will be used on site and off site. 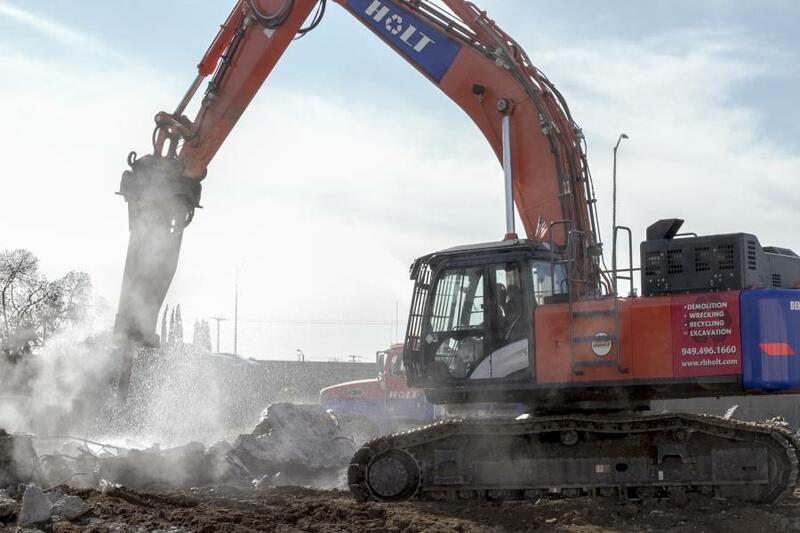 R B Holt purchased its Hitachi 470 excavator in 2016 and its Hitachi 350 excavator in 2017 — both from Coastline Equipment, a John Deere, Bomag, Hitachi and Wacker Neuson dealer headquartered at 6188 Paramount Blvd., Long Beach, Calif. This was not the first time that R B Holt has worked with Coastline Equipment; in fact, the companies' business relationship goes back more than a decade. R B Holt and the company's Project Superintendent, Hugo Rivera, had initially first worked with Coastline back in 2005 when they rented their first Hitachi excavator. Rivera said he relies on Coastline for their excellent service, parts support and reliability. He also relies very heavily on company's onsite service for parts and service, as well as Coastline's proximity to R B Holt. Having recently expanded into the Nevada and Idaho markets, Coastline now has 11 locations providing service and support. R B Holt, Rivera and the company's operators are impressed with the performance of their Hitachi excavators. Additional equipment used on the Tustin job site were a Komatsu WA 500, two Kubota skid steers and an Eagle concrete crusher. With a timeline expectancy of 100 days, R B Holt completed the project in Tustin on schedule in mid-December with more than 100 truckloads of plastic, wood waste and insulation ultimately being transported to local recyclers for sorting and processing — this included 90 percent by weight of all materials that were recycled. More than 400 tons of wood beams from the roof structure were salvaged and will be re-used eventually on other projects. Rivera said he loved working this job site due to location and ease of transportation. And business is looking good for R B Holt for 2018, according to Rivera. “With a new administration in Washington and residential housing starts up for the first time since 2010 in Southern California. We're looking forward to a very healthy 2018,” he said. For more information, visit https://www.coastlineequipment.com/.